The chromosome number of all African violet species is N=15. A number of hybridization attempts have been made between many of the species (Arisumi, 1964; Clayberg, 1961). The results indicate that there are little if any genetic barriers between species, as most can be freely crossed with any other and produce fertile offspring. Two plants which do not seem to cross freely with the others are Streptocarpus nitidus and Streptocarpus shumensis. While these two plants are interfertile with each other, difficulty has been reported in obtaining hybrids between them and other species or subspecies. All attempts to hybridize African violets with other members of Streptocarpus have failed. 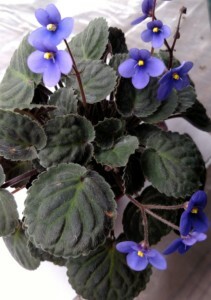 This includes the results of an exhaustive study to cross fourteen taxa of African violets with three species from subgenus Streptocarpella (Rousos, 1981). None of the 1,000 crosses made with plants grown under three different environmental conditions produced any fruits or viable seeds.